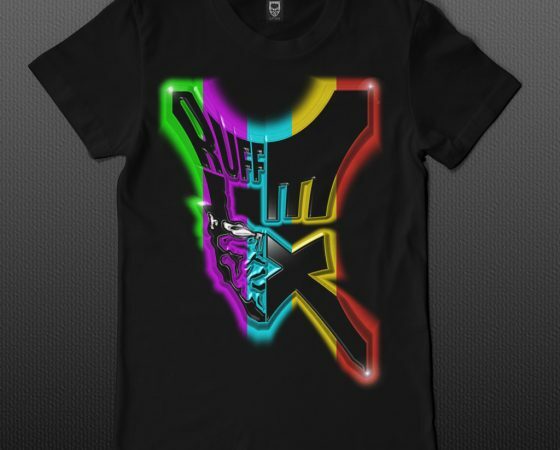 Limited edition Ruffex shirts available ! Home / News Category / Limited edition Ruffex shirts available ! In my quest to bring some original stuff i have finally managed to print the Ruffex logo in SEVERAL colours on a shirt. The technique in the nineties was not good enough to have a decent colour fade. The logo at that time was made in photoshop with the extreme filter effect that made it kind of “3D”. Now with the help of new printing techniques, we have managed to create really cool digital prints keeping the image as close as possible to the original file! The design on the shirt ACTUALLY IS MADE from the original file i always kept in my vault, so you are basically looking (and maybe even wearing) a digital copy of the original file that was used on the RUFFEX 9 & 10 sleeve cover! This special design will be around for a short time and can is available as of …. NOW!